Just two years after setting up in business together, Mark Thompson and his father Gerry were celebrating. Not only had they established a successful battery supply business, but the pair had also developed the world’s first four pin socket solar powered docking station and won the UK Trade & Investment West Midlands Region Export for Growth prize 2012. 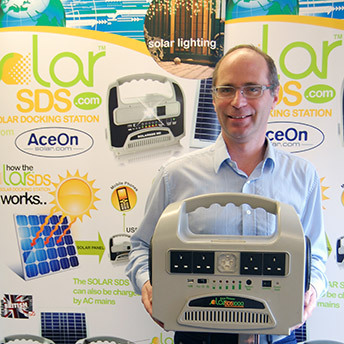 The SolarSDS™ is a ‘plug and play’ electric solar generator which enables the user to access free electricity on the go. The potential for its use is enormous. There are estimated to be 1.6 billion people worldwide without access to reliable mains electricity. This low-cost, environmentally-friendly unit can potentially revolutionise their lives. The docking station allows connection with a smart phone, which can provide music as well as internet access. Having invested their own savings in the original R & D, and with an existing bank loan from Barclays to support the growth of the core business, Mark and Gerry were looking for additional finance to make some modifications to the prototype and put the SolarSDS™ into production. A broker introduced them to ART.